During 2018, professional riders extensively tested a range brands from over 50 product types for HORSE & HOUND magazine and scored them for performance, style, fit and value for money. From this group of winners they then selected the very best and named them “Best in Test 2018” in the January issue – with Just Chaps Dri-Rider Waterproof trousers featuring in this elite group. Designed by Helen Salmon from Just Chaps, these trousers are light-weight, comfortable – and completely waterproof. With a non-slip full seat and a wide range of sizes for a great fit over leggings, joddies or thermals– these trousers are a must-have as the winter begins to bite. 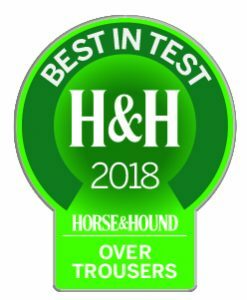 For the full review visit horseandhound.co.uk and for more detailed product information visit our Dri-Rider Waterproof Trousers page. Copyright © Just Chaps Ltd. 2002 - 2017. All Rights Reserved. Website was designed and built by boxChilli.